More than seven decades ago the story “Dumbo the Flying Elephant” was written by Helen Aberson and Harold Pearl to be produced for a Roll-A-Book–a box with little knobs that readers turned to read the story through a window. At that time, an impressionable Walt Disney purchased the rights to the story and published 1,430 copies of a book-version of their tale. On October 23, 1941, Walt Disney released the story on the big screen as a 64-minute animated feature length film starring none other than DUMBO himself. The narrative is told from DUMBO’s perspective while the humans in the story remain background characters. Award-winning actor, Michael Keaton, (V.A.Vandevere) adds that though the theme is simple it’s also relatable. He says, “It’s about family. My character Vandevere never really had a family, and deep inside, that ate him up.” It was the one thing his money could not buy, a family Medici created. The Medici Brothers traveling circus falls on hard times during World War I and struggles to make ends meet. Max Medici (Danny DeVito) purchases an expectant mother elephant in hopes that her baby will be the adorable act needed to bring in the crowds necessary boost revenue. The offspring is born and is adorable but has unusual physical features namely his ears. They are giant size. Medici is furious with the man who sold him the mother and demands a refund. For a price, the mother is returned but Medici is left with the baby. His hope for a crowd-pleasing spectacular act dwindles. Medici’s horse act star, Holt Farrier (Colin Farrell) went to fight in the first world war leaving his wife and two children to carry-on their existence within the circus family in his absence. Holt returns to find his life as he knew it dramatically changed. His wife died, he lost his arm in battle thus looses his horse-riding career and doesn’t know how to connect with his two children, Milly (Nico Parker) and Joe (Finley Hobbins). Grateful to Medici for caring for his family in his absence Holt takes the job to care for the elephants. It’s not his idea of the ideal position until his children get involved. They have a secret to share. 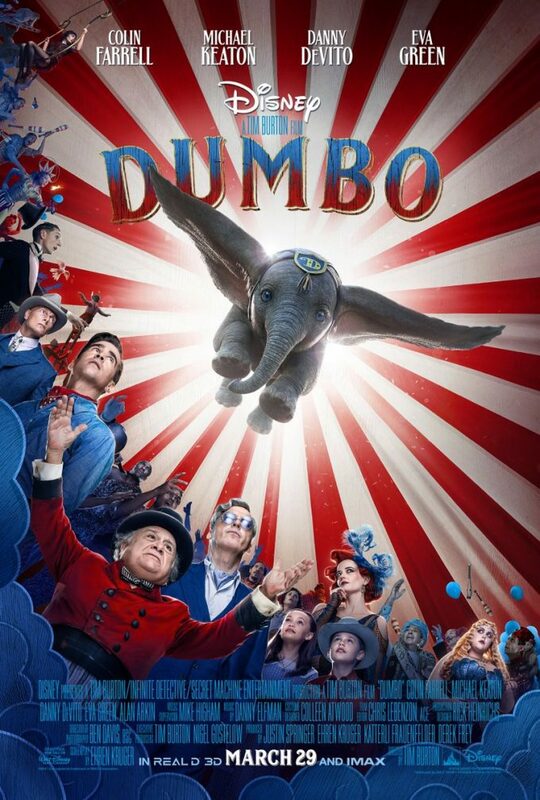 Milly and Joe befriend the baby elephant and discover that he has extra ordinary talents using his gigantic ears that could be of benefit to the circus and the people it supports. Dumbo, the baby elephant, can fly! The journey of Dumbo the flying elephant begins. Medici is thrilled to have finally the act of a lifetime to save his circus family from it’s demise. The fame of Dumbo draws entrepreneur V.A. Vandevere (Michael Keaton) to check out this phenomenon and to persuade Medici to join his state-of-the-art amusement utopia, Dreamland in order to give the Medici circus family a better life. But, in reality Vandevere has other plans. Dumbo the flying elephant is more than a famous circus star. He’s an unsuspected hero that unites family ties and brings a deeper meaning to the institution of family.